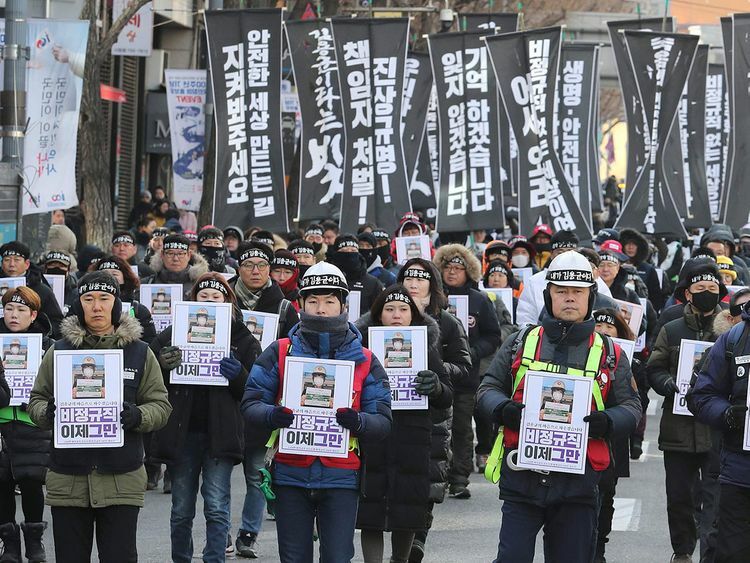 Seoul: Some 2,500 South Koreans marched through Seoul Saturday to honour a worker who was crushed to death at a coal plant fuelling an outcry which led to a landmark amendment of the nation’s industrial safety laws. Kim Yong-kyun, 24, died last month after being sucked into a coal conveyor belt. He was working as a contractor at a power plant 110km south of Seoul. His death triggered uproar in South Korea where critics say work safety is compromised for temporary or contract workers — despite being a wealthy, developed economy which is the fourth biggest in Asia. Kim was the ninth subcontracted worker to have died from work-related injuries at the Chungnam plant in Taean since 2010. Kim’s mother, Kim Mi-sook, refused to hold a funeral until the government introduced protective measures for temporary workers, 60 per cent of whom are deprived of employment benefits including health insurance. The funeral ceremony finally took place on Saturday after the government offered to turn 2,200 temporary workers into full-time employees. Street protests following Kim’s death led to the amendment of the Industrial Safety Act, which bans companies from subcontracting high-risk tasks such as those requiring the use of mercury. Young temporary workers attended the funeral wearing headbands that read ‘I am Kim Yong-kyun’. Kim’s father, Kim Hae-gi, sobbed as he hugged the coffin. “I hope you get to be born again,” said Park Seok-woon, the chair Korea Alliance for Progressive Movement, a local NGO, at the ceremony. “I hope you get to live in a world where life is valued more than anything else”. South Korea has one of the highest workplace fatality rates among developed countries. According to labour ministry data, 1,957 South Koreans died of work-related injuries or diseases in 2017. Of 20 employees who died after being injured while working for the nation’s five major power plants from 2014 to last year, all were subcontracted workers, according to a report by lawmaker Lim Lee-ja’s office.